KARACHI – Despite the passage of over eight months, thousands of survivors of the unprecedented monsoon floods last year in Thatta district have not unable to start their routine life again. Though the majority of these flood survivors, who were displaced from their native residences during the floods, have returned to their homes, they are still emotionally and economically troubled. Most of them are afraid of more floods in the next monsoon starting in August. Many international donors preferred providing funds to non-governmental organisations (NGOs) working on national level, and these NGOs are now winding up as their project-based work is over. Social workers of various local NGOs have alleged that all the national-level NGOs that were provided with huge funds by international NGOs have not helped the flood survivors in a proper manner, and if this situation prevails, the crime rate would rise in the district. During a visit to various flood-hit remote villages of Thatta district, the flood survivors told this scribe that though some NGOs have helped them in rescue and relief works, no one has so far helped them with proper rehabilitation. “We were unable to take our luggage, money, other valuables and, most importantly, our livestock with us while escaping the flood, which means we have lost everything. We were only given food during our stay at the relief camps and were asked to go back and restart our lives, but we have nothing here,” said an elderly lady of a small village near Jati taluka. The Pakistani history’s worst flood caused devastation across the country, but Sindh was the most affected province, whereas Thatta district was the worst affected in Sindh for being the last district on the Indus River where the flood stayed for around two months. Official data reveals that around a million people were directly hit in this most-backward district of the province. Thatta has already suffered a lot due to lowest literacy rate, highest poverty ratio, continuous tropical cyclones from the Arabian Sea, acute water shortage due to decreasing flows in downstream Kotri and sea intrusion. A large number of the population is already planning to migrate, and in such conditions, the floods have completely destroyed this most-vulnerable deltaic district of the province. 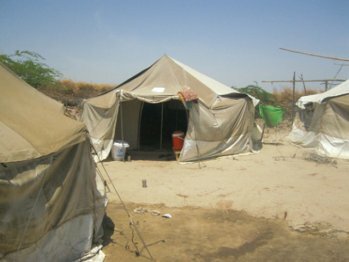 “Most international aid agencies – including the United Nations and the International Organisation for Migration – ignored the local NGOs and preferred to provide funds to national-level NGOs from Islamabad and other parts of the country,” said Muhammad Adam Gandhro, the chairman of a Thatta-based NGO Keenjhar Fishermen Welfare Association. “We believe that the national NGOs’ work is unsustainable because right after finishing the project, they leave the area and the flood victims suffer a lot,” Gandhro added. He has around 1,000 members in his organisation and most of them are professional fishermen. “When the flood started affecting the district, we were the first to volunteer for rescuing the people and save them from drowning, and no government or aid workers were found anywhere. However, we were not given any credit and the international aid agencies have not offered us any projects either,” he said. Right after the floods hit the district, an organisation funded by banned religious organisations reached the district and started relief work, and all the local NGOs who worked with that organisation were excluded by the international aid agencies. “Sustainable development and rehabilitation of flood survivors is impossible without capacity-building of local NGOs. Therefore, we request international aid agencies to think in this regard,” said Sindh Sujag Social Welfare Association Thatta President Ibrahim Hijab. Most flood survivors in Thatta are either fishermen or farmers. The farmers are unable to restore to their routine life as most of their lands were destroyed and their houses collapsed due to the standing floodwater. Many aid workers helped them during the relief operation and provided them with food when they stayed at the relief camps, but now they need to construct their houses again and fix their lands and buy livestock, which seems very difficult at this point in time. In such conditions, another flood would devastate them completely, and the government needs to take concrete steps and make foolproof arrangements for them.